The first skin tight bodices were crafted by Jules Leotard during the Victorian era of the late 1800s. 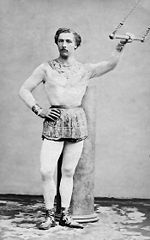 The leotard was made solely for men, namely circus performers, while women performers kept to inflexible and rather dangerous corsets. 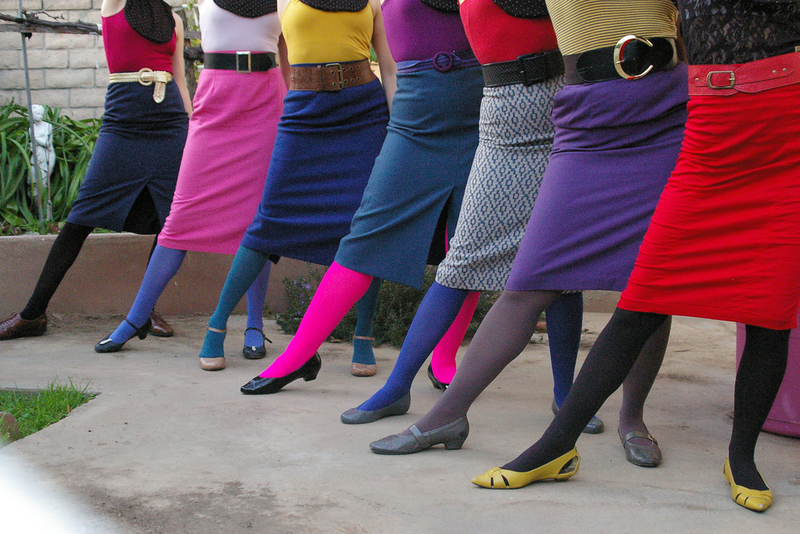 While men still wear leotards, or “biketards”, for cycling, swimming, rowing, etc, the name will forever be synonomous with women and dance fashion. One of the first pair of rubber soled, canvas shoes was created by Charles Goodyear – yup, the same name associated with tires. In 1916 the shoes, called Keds, were mass-marketed as the first sneaker. The name “sneaker” was bequeathed by advertising man Henry Nelson McKinney, because the rubber sole made the shoe so quiet. 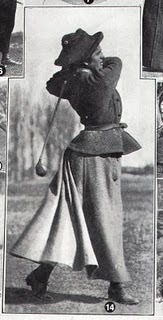 The fabric of choice for women who golfed in the early part of the 20th century was tweed. Hmm…sounds heavy. 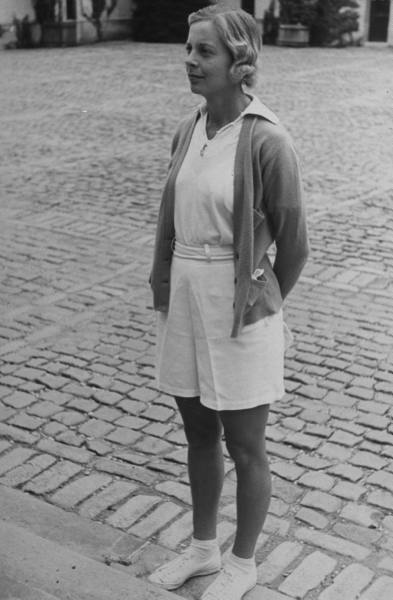 While long layered skirts slowly became long wide-leg plants, it wasn’t until 1932 that Alice Marble made waves walking out onto the tennis court in shorts at Wimbleton. 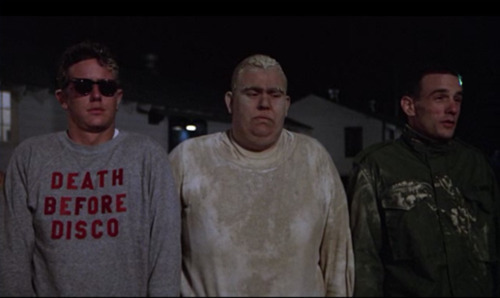 The world was aghast, but thankfully, we never looked back. In the 1800’s women wore skirts and pantaloons made of heavy fabrics that would not become see-through in the water. They also came with weights sewn into the fabric to keep the fabric from floating up. It took decades of fighting for women’s rights coupled with the invention of Lycra around the 1930’s that brings us to the swimwear and bikinis we know today. KISS might have been the final blow that killed dancing as a socially acceptable thing to do. Noting the temporary outcroppings of dances surrounding music videos and movies, we still never fully recovered from the backlash against disco. And only a few years later were computers born, keeping us complacently docile and more susceptible to head bobbing as a form of musical appreciation. It’s a shame we don’t dance in America. We tend to view it as a spectator sport. From an evolutionary perspective, dance let us show off to potential mates. Like peacocks strutting their feathers, it displayed physical capabilities and breeding skills, the remnants of which can still be unearthed in dance clubs today, however, online dating is taking the opportunities and fun away. The most colorful peacocks today have 1000+ friends and a killer Facebook profile. From a social perspective, dance is a way to celebrate, congregate, and enjoy community. 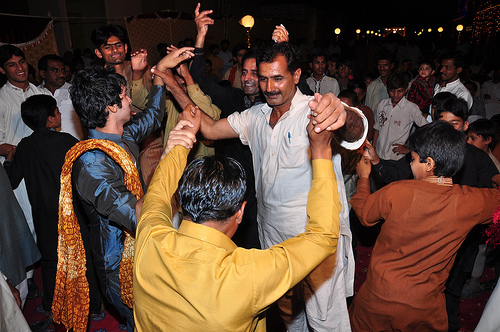 Almost every culture in the world has a social dance that is crucial to their heritage. 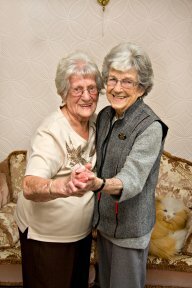 In plenty of places, dancing is still an important way of getting together and letting loose in everyday life. Brazil has it down, as does India. There is no dancing like in a Bollywood film, and it only mirrors the societal importance of dance in celebration for men and women, young and old. Finally, from the physical perspective, dance is a way to stay healthy and in shape, getting the heart pumping, and the brain lapping up all those feel-good neurotransmitters. Dance helps balance intrinsic muscles and joints, and our mental capacities in ways we now use somatics, pilates, and yoga, to try and do. Researchers at Washington University have even found evidence of dance helping to control movements in patients with Parkinson’s Disease. So we get it. Dance is good. It all makes sense, but we still can’t help but cringe at the thought of jumping up moving around. 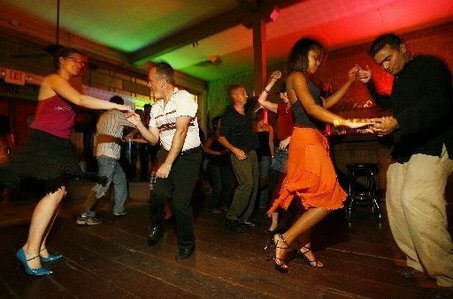 Generally, the places one feels safest dancing are – the hidden underground belly of a dance club (with the aid of alcohol or recreational drugs), at a wedding, (with the aid of alcohol or recreational drugs), at home with the XBox game, or regulated to a sterile gym fitness class. Unfortunately, our motives are deeply ingrained, and “cold dancing” is a tall order. The larger the group of people dancing, the easier you’ll find it to be….that’s why it’s social. Try releasing a hangup or two, grab a bunch of friends, and in the immortal words of Swing Out Sister “Break Out”. It could become infectious. And if it’s not, who cares, you and your friends will feel great. Maybe we need office Spotify dance breaks, where every few hours a song comes on, encouraging movement within the entire office, from receptionist to CEO. I like that picture. You’d be surprised what camaraderie will ensue when dancing next to your boss or the IT personnel. Until then, I dare you to try and bust a move this week. If you are in Los Angeles, I highly recommend catching the Beauty Culture Exhibit at the Annenberg Space for Photography before it departs on November 27th. And if you aren’t so close to Los Angeles, you can still experience the viewpoint of photographers and some of their images on the Annenberg website. It’s thought- provoking, stunning, and horrifying, all at once. In a word – intense. Photographer Lauren Greenfield created a 30 minute documentary for the exhibit which runs in a loop in the center of the gallery. It displays the highs and lows, the grace and pain, and everything in between that is modern beauty. 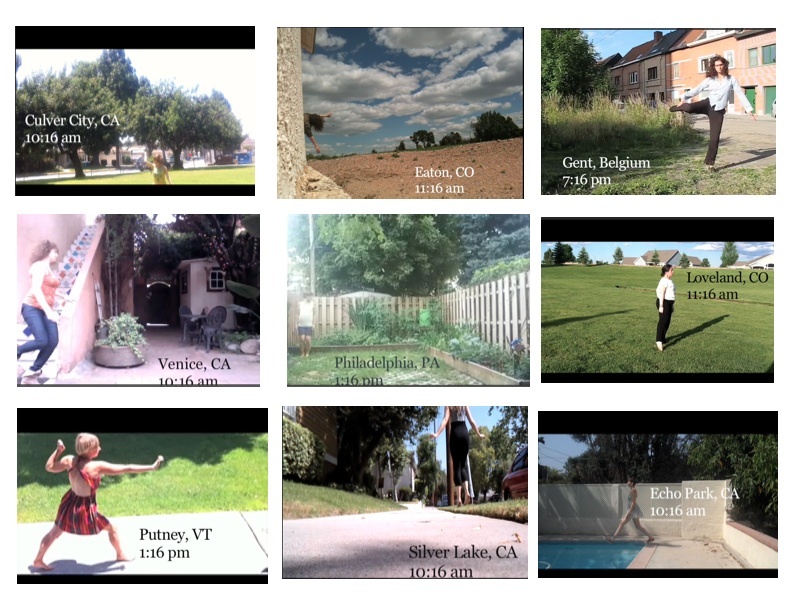 I only hope Greenfield is able to publicly showcase the documentary after the exhibit. Beauty is so intertwined with our lifestyle and society, it can neither be all good or bad, and Greenfield does a great job walking the line between both extolling its virtues and being all too aware of its devastating traps. In conjunction with the exhibit, throughout the month of October there is a great speaker series, discussing the topics of beauty and society. Here are the dates and schedules, but for more information, click here.